You’ve grown tired of hearing one of your friends telling you he’s got the music in his blood since the day he was born and you sigh. You’d probably be surprised to find out that a new study proves he is totally right. Unfortunately for him though, there’s nothing special about that: every 2 or 3-day-old baby can detect the beat in music. Researchers at the Institute for Psychology of the Hungarian Academy of Sciences and the Institute for Logic, Language and Computation of the University of Amsterdam discovered that humans are the only beings who synchronize their behavior to rhythmic sounds. The phenomenon is called “beat induction” and probably led to the creation of the music itself through clapping, dancing using and one’s voice to sing. The phenomenon was not detected in other species such as chimpanzees or the bonobo. The new findings show that this sense of rhythm is not induced in the first months of life by parents through actions like rocking, as previously believed. 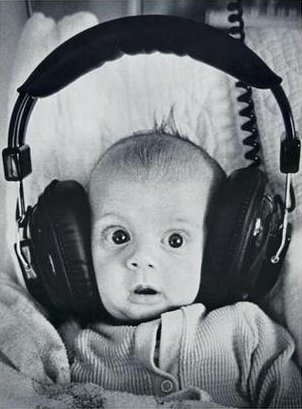 Apparently, feeling the music and reacting to it is either innate or learnt in the womb especially as the auditory system is partly functioning about three months before birth. Beat induction is also used later in a child’s life as it allows him or her to adapt to the rhythm of someone’s speech, to know when to answer and use their voice according to the situation. In order to find these results the babies were given self-adhesive ear-couplers while scalp electrodes were placed on their heads in order to measure their electrical brain signals. A simple, regular rock rhythm consisting of hi-hat, snare and bass drum was delivered to the infants. Other variants, in which strokes on non-significant positions were omitted, were played to the babies with a deviant segment, missing the downbeat. Immediately after each modified segment, their brains produced an electrical response which showed that they were expecting to hear a certain beat, but that did not happen. Maybe not a total surprise, this study can be an indicator of our evolution and of what it is that makes us human, after all. Could music be the answer?